Cutting energy costs, avoiding greenhouse gas emissions and air pollution, reducing uncontrolled light spill, ensuring the safety of people ‒ urban planners must keep all these factors in mind. Advanced technology by OSRAM Lighting Solutions conserves energy, providing the required amount of light when and where it is needed. Childcare. Community amenities. Infrastructure. Local communities are faced with a multitude of critical topics to solve. Street lighting as a feel-good factor and basis for safety is an important aspect, but ultimately it is just one of many. To help municipalities invest wisely and at the same time take care of as many other projects as possible, we have introduced the Streetlight 40 family of luminaires – a cost-effective and uncomplicated but yet durable and efficient solution for comprehensive light infrastructures in cities and towns. OSRAM Lighting Solutions not only offers state-of-the-art, energy-saving LED street lights with excellent luminance properties. Our powerline network-based Street Light Control (SLC) light management system also allows the operator to control and monitor lights individually, in groups, or by entire streets or blocks using computer software. Illumination of streets and squares can be dimmed automatically and dynamically depending on daytime and seasonal conditions, and error messages can be recorded and categorised automatically for efficient operational decision-making. 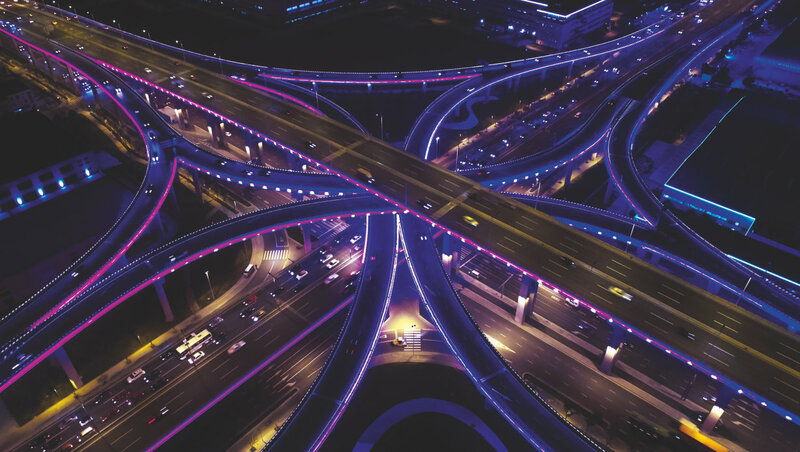 Advanced wireless networking technology opens up new opportunities to integrate additional smart functionality into street illumination networks. Individual light poles may serve as multifunctional stations capable of charging e-bikes, monitoring parking space availability or measuring air quality. The atmosphere in automobile tunnels is highly corrosive due to the high concentration of aggressive exhaust fumes and the accumulation of moisture. Tunnel lights require special protection to survive these ambient conditions and should be low-maintenance to minimise interference with traffic. OSRAM Lighting Solutions can supply luminaires with stainless steel housings and high protection rating which provide the glare-free light drivers need for optimal visibility and safe driving. In addition, we offer a range of accessory lights for illuminated traffic and emergency escape route signage. Indoor and outdoor car parks require appropriate lighting to help drivers find their way easily and see pedestrians and moving vehicles before it is too late. Luminaires and trunking lights by OSRAM Lighting Solutions provide the right illumination quality and level for car parks of any type. In addition, state-of-the-art wireless communication networks allow lighting systems to incorporate OSRAM “Einstone” beacons which can deliver local guidance and parking space availability information and directions to mobile devices using appropriate apps. Lighting installations at car parks may also double as charging stations for electric vehicles. Major crossroads require utmost attention from all road users, and clear visibility of vehicles and pedestrians, signage and markings is key to accident prevention. Bright, well-focussed, glare-free illumination by OSRAM Lighting Solutions makes a significant contribution to road safety. On the other hand, train and underground stations and bus terminals are important parts of a city’s architectural self-image, and lighting design plays a key role in the way urban culture is perceived. Advanced lighting concepts by OSRAM Lighting Solutions give designers plenty of flexibility in ensuring pleasant illumination, excellent visibility, clear guidance and a positive aesthetic appeal while enhancing safety. What is more, LED technology is economical thanks to low energy consumption and easy maintenance.